The Good Life is exactly that. Located at the end of a peaceful cul-de-sac, it is a 50m walk to stunning, dog-friendly and off leash Cormorant Beach. Flanked front and back by green beach reserve, it boasts a fantastic front deck; a private, rear deck lounge; and even a 1.6m high glass-fronted beer fridge to ensure you're never without a cold, refreshing beverage! Recently revamped to meet all your holiday needs, including beautiful new bamboo flooring in the lounge room, hallway and stairs, there's an outdoor shower, a secure area for your puppy dogs, and even a separate TV area with Google Chromecast and bunkroom downstairs for the kids. Upstairs, the grown-ups can commandeer the new 48" smart TV with free Netflix for themselves and an office area and wireless internet means you can extend your holiday and work from home. Your boss need never know! Come and experience The Good Life. The reluctantly overseas owners have worked hard to make it more than a home from home, especially with the front deck - giving you that extra piece of alfresco space to enjoy the views; soak up the sun; or cool down in the shade. They try to get back as often as they can to experience The Good Life as a holiday home, testing it to its limits with family and friends to ensure they create the perfect experience for future guests. Bedrooms include 1 king, 1 queen and a 4-bed bunkroom. Bathrooms include a main family bathroom with a bath and a separate downstairs shower room. TOP TIP: Sleep with the blinds open in the king and queen bedrooms so you wake up to the awesome views! Oh and out of season, if we don't have guests immediately either side of your booking, we endeavour to let you check in earlier and out later! PS - Please no cats, afraid one of us is allergic. Owners Vicki and Kevin are currently living in the UK, so there may be a slight time delay in their reply. Emails are however usually answered within 12 hours. Kevin and I met whilst working at the 2000 Sydney Olympics; me (Vicki) an English backpacker and Kev - a Canberra boy. I dragged him to the UK less than a year later and we married in 2003. From there we worked on other sporting events in the UK, the Middle East and the 2010 Vancouver Olympics; before settling in France for 6 years and opening a coffee shop called Kitsch Kafe! We're now back in the UK where I work for a communications agency and Kev is renovating our 350+ year old townhouse. We don't have children as we opted for a fur-kid instead: our beloved 10 year old lab/border collie cross called Puck - who is actually from Nowra, NSW and travelled with us from Oz to Vancouver and back to the UK! We would so much love to take him back to his Bawley home that he adored, but would not want to put him through that flight as an older dog. He now sleeps under my desk at work quite a bit and is Kev's apprentice for the home renos! Kev spent a lot of his childhood and youth on holiday from Canberra in Bawley and the South Coast area, plus we have some very good friends who have a place there that we've often stayed with. It was whilst staying with them during our honeymoon that we decided we needed to keep some Aussie roots and thought - what better place than Bawley! The same friends found The Good Life for us after we left and we bought the house unseen! We've never looked back, but only wish that time and money would allow us to visit more often. Definitely we hope to retire there when the time comes. The house is a perfect getaway for couples or families and because it's our second home, we continually make improvements to make sure it has all the home comforts necessary to provide the perfect holiday experience. The downstairs area for the kids works really well, yet the upstairs is doubled in size by the front and back decks so that there is always a quiet space for everyone to find. As the house is in a cul-de-sac, there is hardly any traffic and our visitors' kids often hang out on their bikes or kick a footie on the road or in the nature reserve opposite. On the subject of nature, during our recent stay at the house in March 2018, we saw dophins, penguins and stingrays in the water; and had kangaroos quietly eating grass in front of the house - disturbed only by the cookaburras laughing at them! We have a resident brown owl that sits in the palm tree on the side of the house and we could just sit for hours on the front deck watching the many birds and generally enjoying the serenity. One of our grown-up nephews calls it the 'Bawley Valium' that hits you soon after you arrive. Amazing really that he still feels that effect when he has two boys aged 5 and under! We all sleep better at Bawley and each time we go it is harder and harder to leave. toilet, tub, shower, Family b-room has a huge bath for sandy kids & a fab shower! toilet, shower, Downstairs bathroom in the laundy room. outdoor shower, Outdoor shower for rinsing off when back from the beach! The Good Life has the best of both worlds: the sound of the waves crashing on the beach, coupled with a stunning view of beautiful and calming Watts Beach Reserve directly opposite the house. WiFi and Netflix included, plus Google Chromeast on downstairs Kids' TV for own internet subscriptions. We have two robust and comfortable 3-seater sofas and 2 retro armchairs, with a large coffee table in between. Large fridge freezer that is more than adequate when all drinks can go in the downstairs beer fridge! Easy to clean and effective induction hob. Cafetiere and stovetop espresso maker, plus Aldi coffee pod machine that accepts Aldi pods ONLY. We leave tea, coffee and sugar out for guests, plus a pint of milk. There is often oil, salt and pepper left from other guests. Soooo many dishes and utensils! Plays CDs. We prefer to use the TV for radio. A good holiday reading choice. A train track with accessories and few bits and bobs. Front and back decks offering fantastic alfresco living and relaxing opportunities! Seating for 8 provided on the front deck with a great communal table, along with a comfy lounge and 2 hammock chairs. The back deck has 2 large comfortable armchairs and a double sofa. 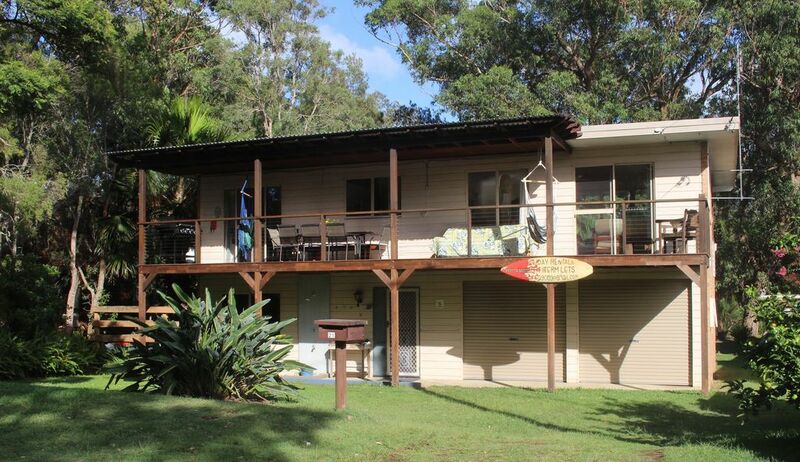 We enjoyed a pleasurable relaxing 3 nights stay at this property surrounded by beautiful bushland. The house was comfortable, well appointed and clean. I was fascinated by the tasteful decor and attention to detail. The kitchen was excellently equipped. The icing on the cake was the 3-minute walk to the beach which we and the dogs made full use of twice a day. This is the fourth year we have holidayed at a vacation home and this has been our favourite. We would have given it a rating of 5 stars had the property been completely fenced off for the dogs as terriers are renowned for roaming. But this didn't stop us from having a superb time. Thanks guys for your wonderful review, we are delighted you had such a lovely time at the house and definitely - finding interesting decorative items for the house is one of our passions! Regarding the fencing, you may have noticed that most of the gardens in Bawley Point are typically unfenced, which gives a greater feeling of space and community. However, the downside of this is that some dogs (like cheeky terriers! ), will either need to be kept on leash, in our dog pen or on one of the decks. Thank you again and we hope to be able to welcome you back again soon. The house is extremely comfortable, with all you could need for a relaxing beach holiday. Wonderfully close to the beach and very peaceful. It was as relaxing as the blurb. Thank you so much for sharing it with us. And true to its name 'The Good Life' is exactly how you would want to spend every day of your life. The house was warm and front and back decks a great place to chill. Perfect for our dogs who loved the nearby off-leash beach. We had many beaches to choose from where we could go surfing and exploring the rock pools ... we will be back for sure. We thoroughly enjoyed our stay at the good life. It was the perfect place to take our fur babies with us on a little vacation. The house was neat and tidy and all the necessary amenities were provided. Excellent location to get to the beach. We will definitely be back!